「김정희 예서대련 호고연경(金正喜 隸書對聯 好古硏經)」은 먼저 내용에서 추사 김정희(1786~1856)가 평소 금석(金石)과 경서(經書) 연구에 몰두하고 있음을 말해주고 있으며, 또 협서에서 김정희가 지향했던 예서관(隸書觀)을 간명하게 피력한 점이 돋보인다. 글씨 또한 이미 외형적 정제성이나 기법적 완숙도에서 벗어나 전혀 세련되지 않은 파격적인 짜임과 마른 듯 까칠한 필획으로 자신이 지향했던 고졸(古拙)한 풍격을 구현해냈다고 하겠다. 김정희의 여러 대련 필적 중에서도 그의 특장이 잘 드러난 예로서 보존 상태도 매우 양호하다. 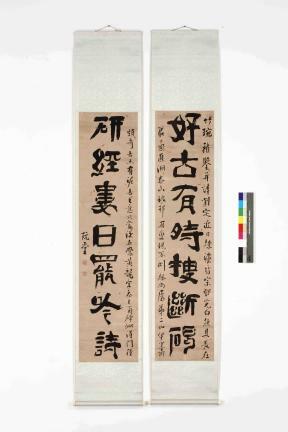 This rhyming couplet titled Hogo Yeongyeong shows that Kim Jeong-hui (pen-name: Chusa, 1786-1856) immersed himself in the study of metals and rocks as well as the Confucian classics. Furthermore, it was with this work that Kim realized his calligraphic style, which is antique and simple, unsophisticated rather than refined, and technically complete. Preserved in good condition, Hogo Yeongyeong is the most representative work of all his characteristic rhyming couplets.